Many companies – and social media managers- are quick to call their social media accounts their community. In 99% of cases, this simply isn’t the case. 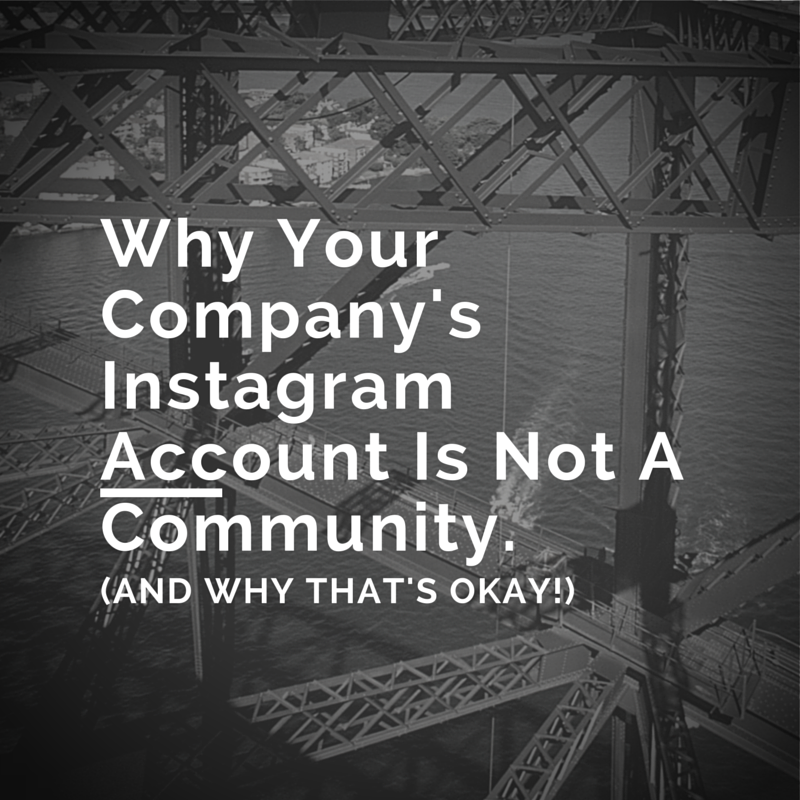 Social media sites – like Instagram- are networks not communities. That’s perfectly okay. Both networks and communities serve super useful purposes. It’s when you confuse one for the other that’s where you can run into problems, as both are suited to different underlying goals and strategies. As defined by Justin Isaf, networks are large groups based around weak ties. They are exceptionally great for brand awareness and growth opportunities. This would be where most social media accounts, such as your company Facebook page, Instagram account, etc, fall for the most part. In fact, the two most common reasons to like a brand on Facebook are if you are a current customer or to receive discounts and/or freebies, according to a study by research firm, Chadwick Martin Bailey. Low engagement rates (Generally between 3-5% of all activity). One-sided conversations driven by the brand. It’s a numbers game. Vanity metrics, such as number of Instagram followers. likes and click-throughs are more widely used to show increased reach and brand awareness. Gimmicks are often used to drive additional brand awareness. These can include contests, giveaways, sweepstakes, etc. A community tends to be a smaller group based around a common interest or shared values. While they aren’t good for growth, they are exceptionally great for retention. In it’s simplest form, this could be separate credentials to log into the community (ex: think single sign-on/OAuth). However, some of the most successful and active communities require applications to join the community. One of the most well-known and best examples of this is Mensa. Mensa is incredibly difficult to join, but once you join, it becomes like a status symbol that you are a part of this elite society. Based around a common interest or shared values. It can vary greatly depending on the community, but most see an average of 10-40% participate on a fairly regularly basis. Many more that engage in passive activities (ex: lurking). Community members tend to form real, lasting relationships within the community. People may initially join the community for the content, but they end up staying for the relationships they made in the process. There’s generally an offline element either in the form of meet-ups and conferences or through digital events such as Google Hangouts, Skype sessions, etc. In many cases, a network can spawn a community or several communities. Then each person in the community can leverage their own individual network’s to grow the community. Are you managing a network or building a community? Please share your thoughts in the comment section below.